The journey on Delta flight 3 began with a Saturday morning meeting at the Mercury Air Terminal on the north side of Atlanta International Airport at 8am. The DC-3, Delta's ship 41, was being towed from the Delta hangers to the Mercury Air Terminal for its 2 hour and 20 minute flight to Orlando. With a capacity of 21 passengers and three seats on the flight deck, the flight would carry three crew members up front, two maintenance support employees in the cabin and 6 lucky passengers all Delta employees. The aircraft was being fueled and the passengers and crew started boarding from the ramp. All passengers and crew were required to wear white gloves and large booties, like socks, over their shoes. This preserved the interior of the aircraft that was as clean and fresh as the day it was originally delivered in 1940. With everyone on board, the aircraft started its taxi for the end of the runway for takeoff. Just prior to takeoff, an engine run up was completed to ensure everything was ready for the flight to Orlando. The DC-3 began its takeoff roll to the west and just prior to lift off the rear of the aircraft lifted off of the runway as the aircraft began to climb from the runway. The DC-3 circled around to the north and back to the south flying directly over the Atlanta terminal complex. The aircraft made a unique departure route from Atlanta due to its slower cruise speed (about 150 mph) and cruise altitude of 5000 feet. When a crew member was asked would the cruise altitude would be, the reply was whatever is comfortable. Since the aircraft is not pressurized and the cabin air is based on outside conditions, the altitude was dictated by a comfortable outside temperature. At cruise altitude, the flight was smooth for the trip to Orlando. At 5000 feet the view was incredible and clear especially out of the sparkling clear windows of the refurbished DC-3. To keep the aircraft in it's mint condition, no cabin supplies are stocked or offered. The lack of in-flight service wasn't missed as everyone was entertained by the historic aircraft, the views, and the authentic TIME magazines from December 1940. The cockpit crew was continued huddled around a pocket size GPS providing the latest navigation technology. It was also interesting to see the cockpit window open providing air flow to the cockpit similar to rolling down a window in a car. The aircraft flew directly over Gainesville, Florida airport and the University of Florida was seen on the right side of the aircraft. The DC-3 started a standard approach for Orlando International airport flying over Orlando Executive airport with the downtown skyline seen in the distance out of the right of the aircraft. 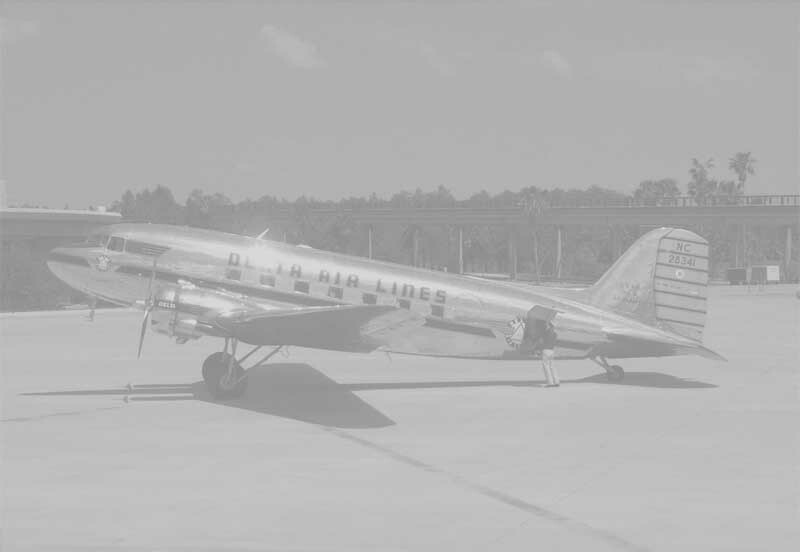 Modern day jets were seen landing on the parallel runways and speeding by the DC-3 at its slower speed. The DC-3 touched down on a clear sunny day on Orlando's newest runway landing to the south. Several seconds after the main gear touched down, the rear tire touched down and the aircraft assumed it's normal posture on the ground with the front of the aircraft elevated and the tail near the ground. The aircraft taxied to the gate with spectators viewing the aircraft from the Comair hanger and other Delta gates. The historic aircraft was greeted by the Orlando team finally parking at gate 93. The engines were turned off and the aircraft came to a rest and deplaning was directly on the ramp. This marked the end of a great trip on a fabulous aircraft. Click on the pictures on the pages of this website to see some of the photos described above.